Do you draw? If so, how do you create time to make a sketch? I try to make a habit of sketching something every day. When I get really busy, which seems like a lot lately, I’m terrible at keeping this promise to myself. 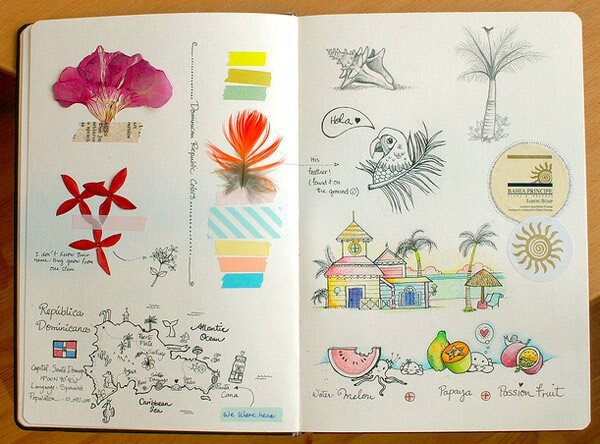 If you know my blog, you might remember that I started the Tinkersketch challenge last summer. 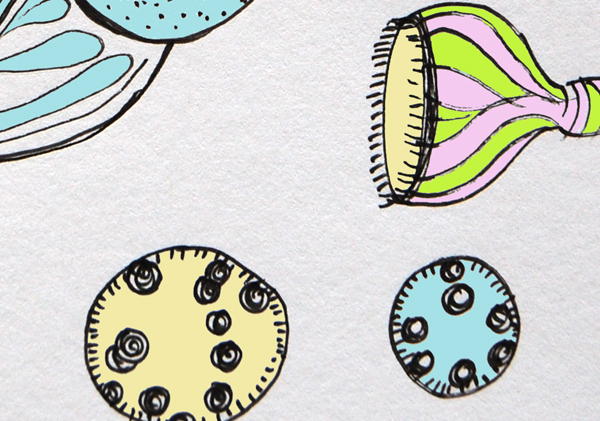 Basically, it’s a simple challenge to make a drawing every day. And to motivate us to play, you were invited to share your sketches on Instagram. Sound familiar? Like some of you, I began this challenge with a lot of energy, but then, like I said, I got busy. And maybe you did too. But even though I haven’t been good at sharing my sketches with you, I do make an effort to jot notes or images down every day. 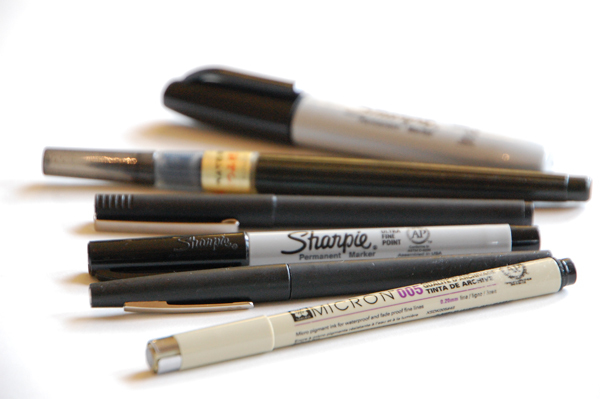 I carry at least one of my favorite felt tip markers in my bag at all times. 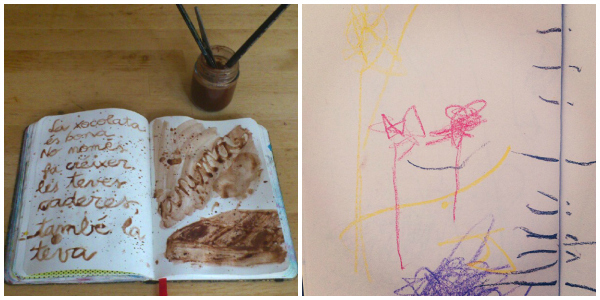 Unless one of my children finds it before I do, having the right tool makes me want to draw more. I carry a notebook, sketchbook, journal, stack of index cards, napkins — whatever — in my bag at all times. Pull out this notebook when waiting in line or when I have an extra minute to spare. All it takes is five minutes and I’m done! More time would obviously be better, but I think it’s more important to focus on workable rather than idealized goals. Yesterday I was waiting, by myself (this is a rare treat), at a deli for some take-out sandwiches. In moments like this I usually pull out my phone and scan it for email updates. But it was also a great opportunity to get in a few moments of drawing. So instead of trolling Facebook, I pulled out my sketchbook and started to doodle. My order was ready about ten minutes later, and as he handed me my bag, the owner asked me if I was an artist. I kind of stuttered over myself, not really sure how to label my current life path. At one point in my past I would have said, “yes,” but now I’m so many other things. So my answer was, “well, I make drawings.” And then he asked me if I’d like to show my work in his cafe. Isn’t that lovely? I had no idea it was going there. But that, my friends, is all from sitting down for a few minutes of doodling. You may have noticed that I’m sprucing things up around here. I’m interested in carrying on with more posts that take a look at what it means to be a creative adult. Not to worry, the child-focused posts will still be around, but it seems like it’s high time to expand the world of Tinkerlab. My plan, and please forgive me for it’s a tenuous one right now, is to make this space your home for all things creative. 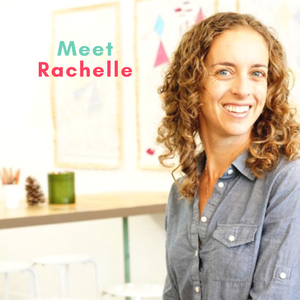 I’m still rather busy, and trying to catch up on sleep while also dropping coffee from my diet, but you can count on weekly updates full of ideas, tips, resources, and interviews in the space of creativity and making. Do you draw? If so, when do you do it and what tools do you use? And if not, is something holding you back or is it just not your thing? 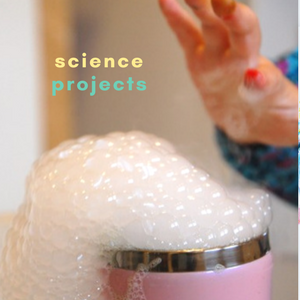 Are you a creative parent or teacher who’s looking for some art ideas? 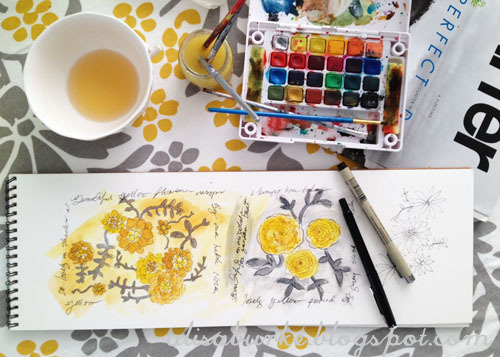 Do you know about the ongoing #Tinkersketch art journal challenge that’s brewing over on Instagram? 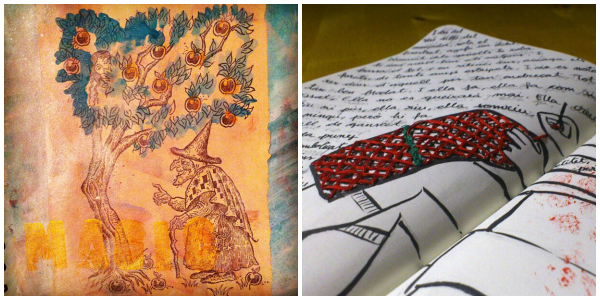 Every day, people just like you and me show up to snap and share photos of their sketchbook art ideas. The idea behind this challenge is to make a little bit of room in our busy parenting lives to create via glueing, painting, collaging, and experimenting in a sketchbook everyday, or as often as we can. When I first introduced this challenge I had a lot more time on my hands (check back tomorrow for an announcement about where my time went! ), and I made time to create a tinkersketch every day. I now experiment in my sketchbook when I can, usually alongside my children when we’re all at the art table, and I never regret the time I spend doing this. I share this to say that if you feel strapped for time, create something when you have the time and your efforts will not go unnoticed by you or your child. 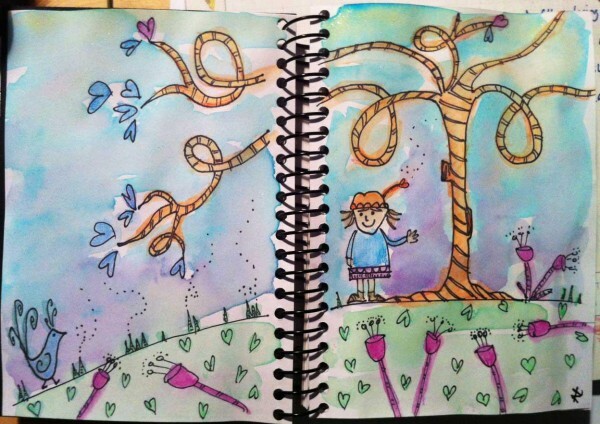 There’s a lovely crew of dedicated tinkersketchers who continue to inspire me and each other with their quick sketches, material explorations, and collaborative art journaling with kids. 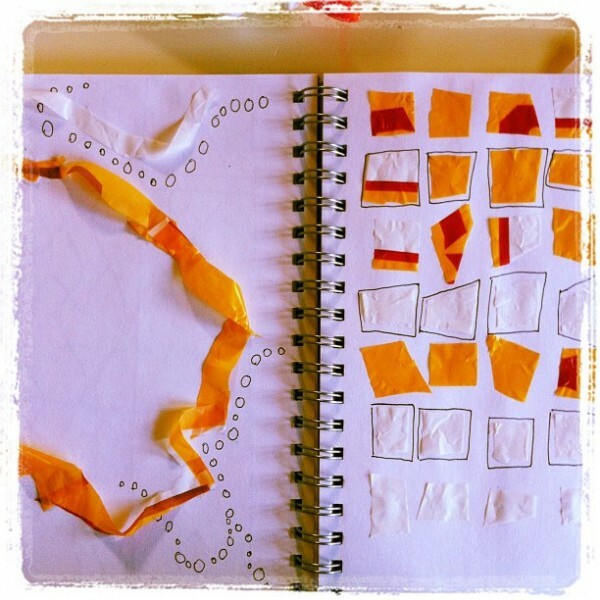 Chelsey, one of my Tinkersketch buddies, wrote this inspiring post about her Tinkersketch journey. She says in the post, “I thought hard about doing it, but was really nervous. I don’t think I’ve ever even owned a sketchbook in my life. I am NOT an artist and do not feel creative in any way.” And then she tackled the project with so much gusto that I’ve considered asking her to take it over! Child’s Tinkersketch: “Lucy is inside a robot and controlling it on the left. On the right is Lucy and theo. theo is sad because he wants to be in the robot., @cmarashian who blogs at Buggy and Buddy. When I first shared this challenge I posted prompts, and it’s been a while since I’ve picked up on this. Will you tell me if this is useful? Feel free to use the art prompts if they work for you or ignore them completely and forge your own sketchbook path. 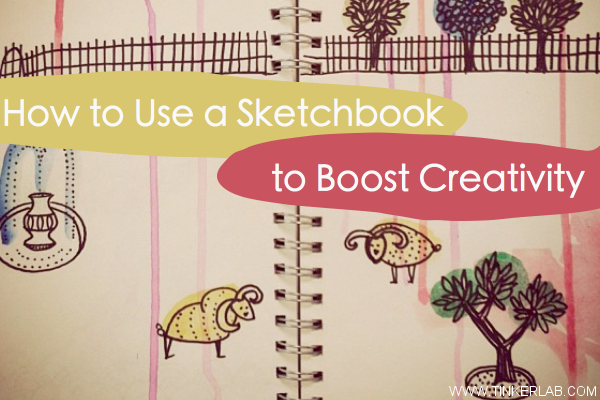 Sketches can happen in a traditional sketchbook or on just about anywhere you can dream up. 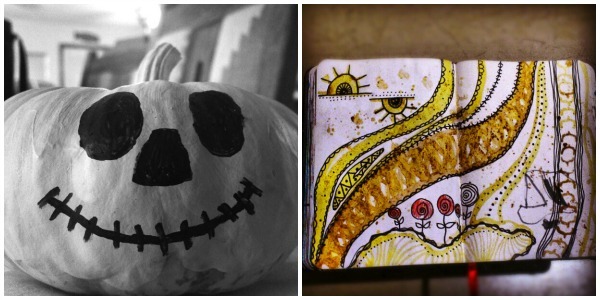 Remember, this past week @Supershortcake made her tinkersketch on a pumpkin, so go on and think outside the box. The objective is to make a little time to experiment with new art ideas in a supportive environment. 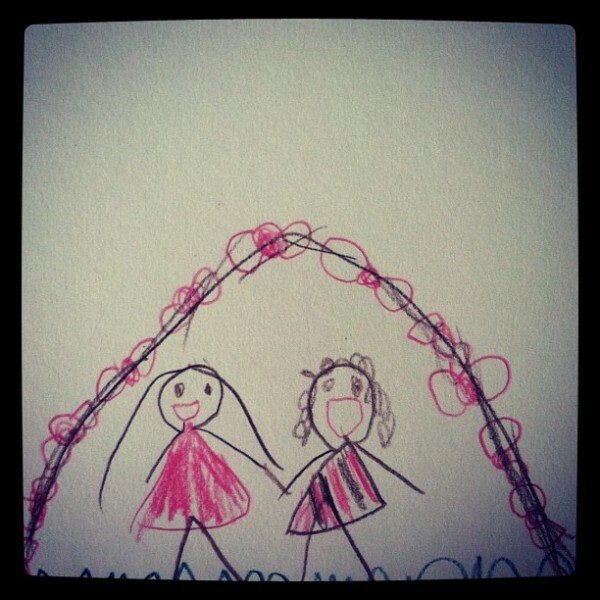 If you’re a Blogger, write a post about your tinkersketch adventures and share it with me! Feel free to snag the button up there if you’d like. If you want to read more about the Tinkersketch project hop over here for the introduction and more info on how you can join. 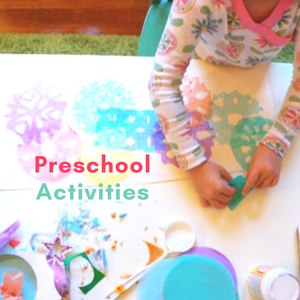 Follow us on Facebook for more kids’ activities and ideas. 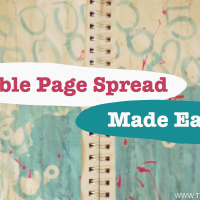 The Double Page Spread Challenge started just one month ago on May 7, and as of today 105 photos have been uploaded to Instagram with the hashtag #tinkersketch. I’m so grateful for this fun and supportive little (growing) community and look forward to sharing updates and prompts with you each week. Although I started the DPS Challenge with adults in mind, the challenge is open to anyone who’s inspired to open a notebook and make something happen inside. If you’d like to infuse your life with more creativity, you’re invited to join the DPS challenge at any time. The drawings don’t have to be gallery-worthy (although some of them certainly are), they just have to happen. One idea fuels another, and no drawing/sketch/painting/collage is too insignificant to be included. Art Journaling Techniques and Inspiration Pin Board from The Mad Pinner, on Pinterest. 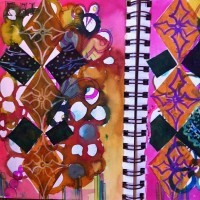 Alisa Burke’s Sketchbooks (above) are to-die-for. I’ll post prompts on my site at the beginning of each week. Some of you requested them, others did not. Feel free to use them if they work for you, or ignore them completely. 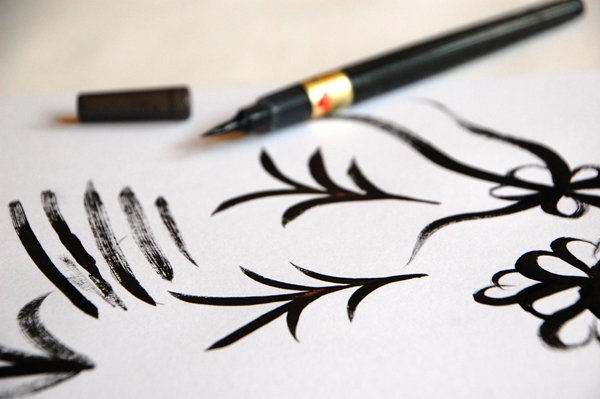 Fill a page with curved doodles. No straight lines allowed. Take a close up photo graph of an object; so close that the image abstracts the original shape. Make a drawing from this photograph to make an abstract drawing. 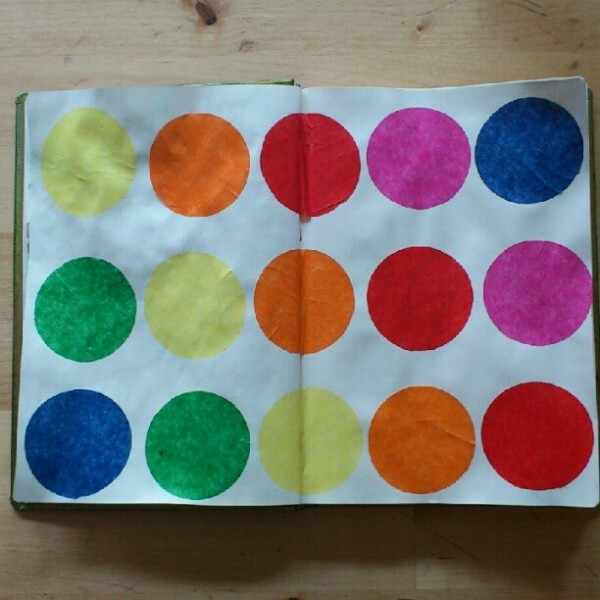 Drip paint all over the page. Hey there. Yesterday was the bi-monthly Creative Challenge, so I’m a day late with my Double Page Spread (DPS) sketchbook challenge prompts and whatnot. If you’re new to this, click here or on the DPS tab in the navigation bar (above). Click on any of the links up there for all the background information you’ll need. This Week in Review. A Sampling. 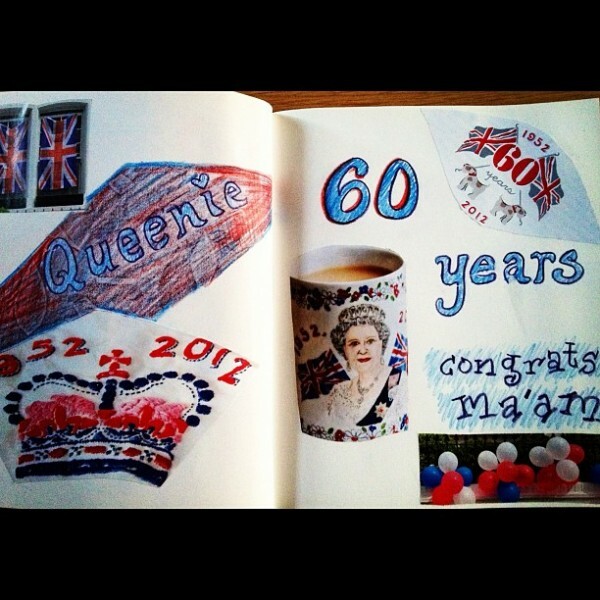 Anna from The Imagination Tree created this DPS in honor of the Jubilee. 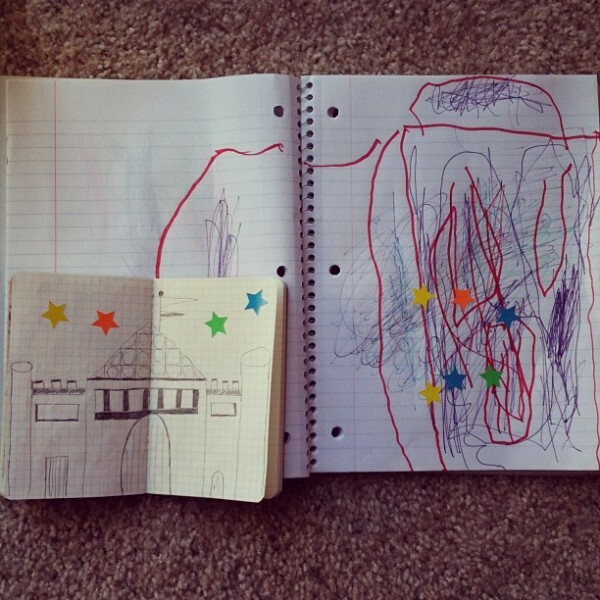 Chelsey and her daughter always create their DPS’s together, and designed princess castles. If you’re not already on Instagram, please consider joining. First of all, it’s totally free. I love free. And it’s one of my very favorite aps and social media outlets, and I cannot recommend it enough. Once you’re on board, you can tag your DPS with #tinkersketch and you’ll see a beautiful stream of images from all the tinkersketchers. Woah, inspiration! If you want to take a peak inside the Instagram/tinkersketch machine, you can click onto Followgram and see the whole stream. Related to this, I just added my Tinkerlab stream to the sidebar over there on the right side of the page. Not only can you follow my creative kookiness and pursuits, but you can see what my kids look like when they’re napping and catch what I’m eating for lunch. Now if that’s not gonna pull you in, I’m not sure what will! I wanted to pull in the whole #tinkersketch stream but it would only pull in my DPS images. If you have any advice for me, I’m all ears. I started a DPS pin board, chock full of all kinds of DPS goodies like drawing prompts, sketchbook inspiration, doodling ideas, and examples of your tinkersketches. Oh, if you write a post about a DPS, let me know and I’ll add it to the board. And finally, here are this week’s prompts. This week I’d like to encourage you to create some space, distance, or movement in your life. Get out of your comfort zone (whatever that means to you) and look for inspiration in places you wouldn’t normally look. Leave home. Go for a walk, sketch in the post office while you’re waiting in line, doodle while your kids are at soccer practice. Inspiration often strikes when our minds get distance from our comfort zone. Just doodle. Doodle for two minutes. Copy that doodle and change one thing about it: doodle for two more minutes. Keep this going until the pages are filled. Write your favorite words in gigantic letters. Experiment with fonts. 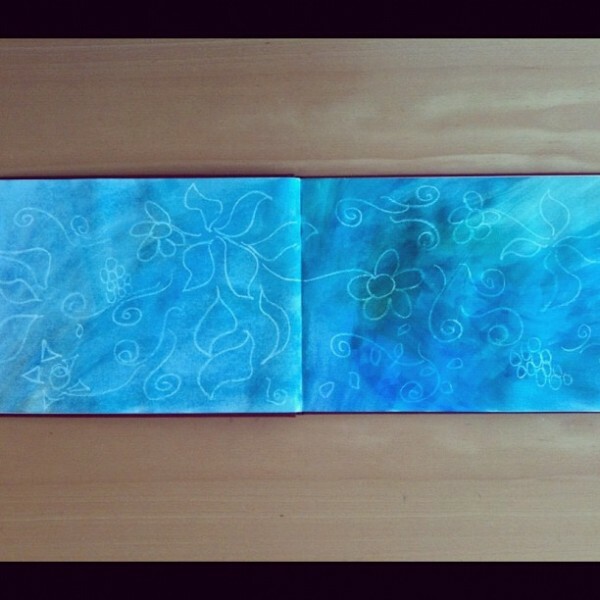 Pour a bit of watercolor paint on a wet rag and experiment with blotting, rubbing, dabbing your papChoer. Use this as an underpainting, or stop with the watercolor. Go to the library and pick out three books with illustrations that you love (fine artists, kids’ books, etc….it’s up to you). Copy elements from these illustrations. 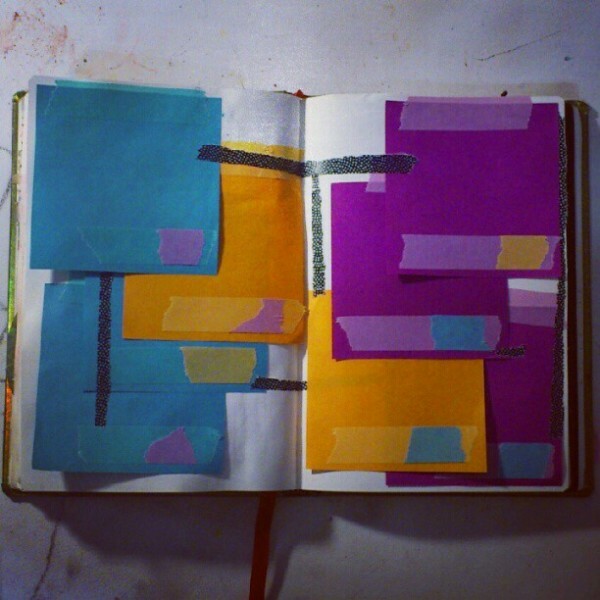 Glue a page from a book or magazine into your sketchbook. With a black Sharpie or paint, block out words that you don’t care for. What remains uncovered is what matters the most. Make a list of things that make you happy. Decorate the list with doodles. Make a list of things you would never do. Circle two that you might try. Add some color to it. Try it on for size. 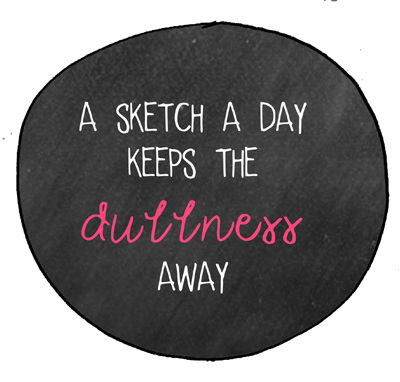 Look forward to seeing your #tinkersketches this week. And see you next week for more prompts and such. 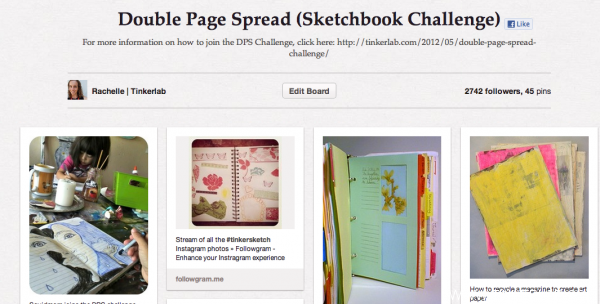 Are you participating in the DPS challenge? You can join at any time and your sketches can be as basic or complex as you like. My friend, Aude, told me that some of the entries I shared last week intimidated her. These weren’t her words exactly, but that was the gist of it, and I thought I needed to reset this challenge since that wasn’t my intent at all. I love how the honesty of good friends can help me grow and and hope you’ll also tell me if I get off track. If you felt the same way or felt discouraged by this challenge, I hope you’ll consider giving it a try. 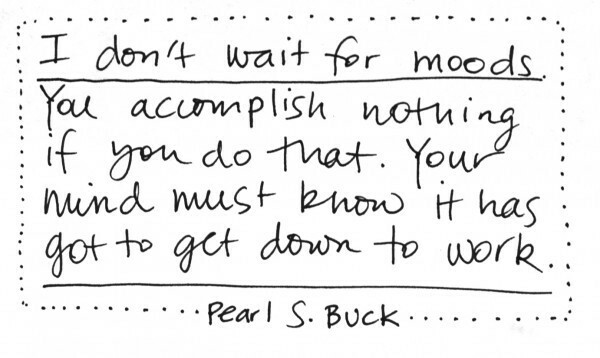 The idea is to show up — FOR YOURSELF — and make something almost every day. So I’m sharing some of my quickest, simplest DPS entries as examples of how easy this can be. The threshold for joining isn’t that high and the time commitment isn’t too grand. 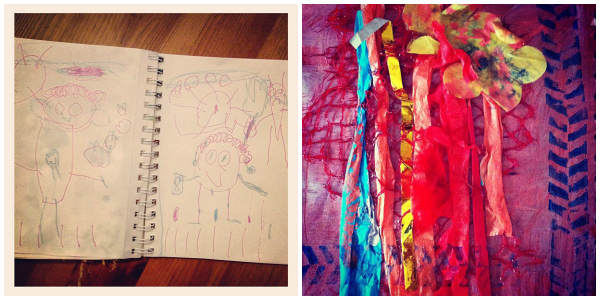 In the picture above, my kids and I painted on a piece of paper that I later glued to my sketchbook. When it dried I added some glitter glue and white reinforcement stickers. It’s simple and didn’t require a lot of special talent, but it works. 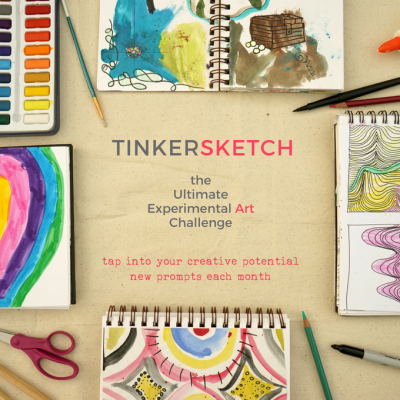 The other wonderful part of this project is the growing community of enthusiastic and supportive #tinkersketchers. 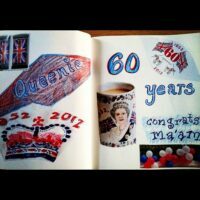 If you’re on Facebook, you can see some of the images that readers have added on my wall. And if you’re on Instagram, you can search for #tinkersketch where you’ll see the full gallery of participants’ posts. We comment on each other’s images and provide each other with the motivation to keep going. Copy a pattern from a towel, dish, napkin, etc. Do you have ideas for prompts? 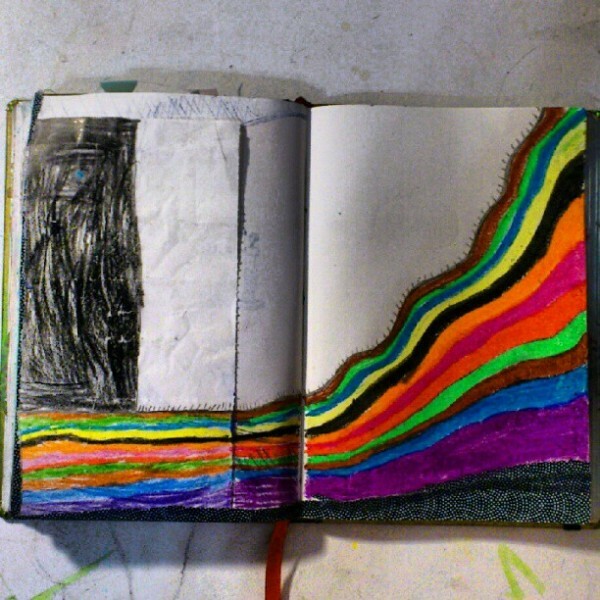 Have you ever kept a sketchbook? 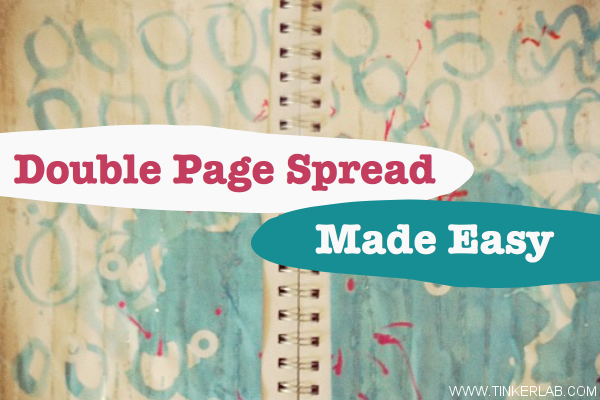 Are you on the DPS (Double Page Spread) journey with me? Have you thought about joining, but you haven’t started yet? When I introduced the DPS Challenge, I talked about the importance of starting a visual journal practice as a way to nurture your own creativity. But did you know that modeling habits of creative thinking such as experimentation, exploration of materials, problem solving, imagination, and a willingness to make mistakes is also one of the best ways to foster creativity and creative thinking in your child? 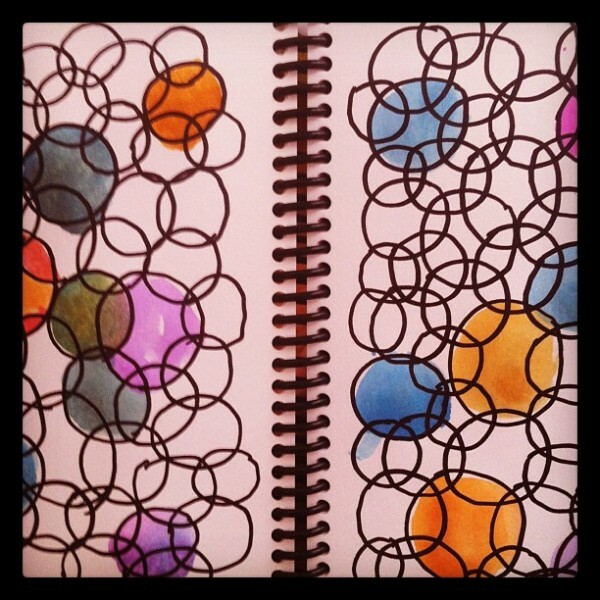 There are a number of ways to do this, and keeping a visual journal of your ideas is an easy way to begin. Are you on the fence? You really want to do this, but how on earth could you find the time? Maybe you’re waiting for the mood to strike, you have a fear of drawing, or you’re on the hunt for the perfect journal? I share these points because these are some of the things that have stopped me in the past: my day got off to a bad start, I slept in, I felt uninspired, or I had nothing to draw on. Wait until you see the last image of this post for a fun solution to that last problem. I hope you won’t let these things stop you because this will only take a few moments of your day and the creative rewards…for you and your kids…are huge. I should add that while I think I do a decent job in the drawing department, my three year old insists that her drawings are better than mine. And yours might too. Don’t let that stop you either. 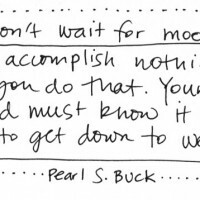 When I came across this quote, it reminded me of my commitment to myself to get right down to business and make something happen in my art journal on an almost daily basis. It’s not always easy, that’s for sure. My kids demand a lot of me. My house will be a bloody mess unless I clean it. I never get enough sleep and could always use just a few extra minutes of rest. And this weekend, the weather was just too gorgeous to be tied down to a journal. But I can’t let these things stand in my way. They’re necessary, yes, but I search for pockets of time when my kids are playing independently, making art, or napping to jot down a quick sketch, collage, or visual reference to something I don’t want to forget. I thought I’d take a minute to share a variety of DPS entries to inspire you and further illuminate how motivating it can be to show up for something when there are others there to support your efforts. 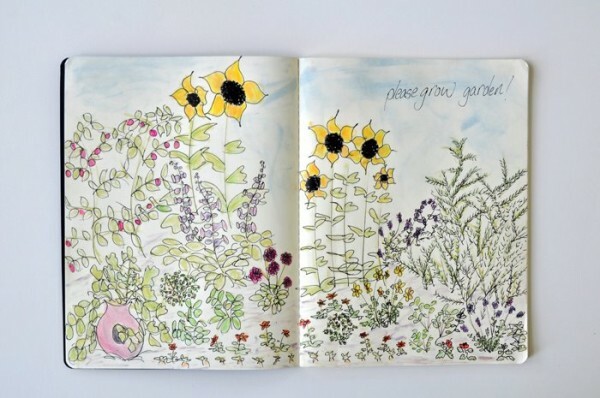 Helen from Curly Birds drew this picture of her picking garden…the inspiration was found right in her backyard. If you’ve been following my #tinkersketch journey on Facebook or Instagram, you’ll know that many of my DPS’s are imperfect, sketchy, and experimental. I’m not about perfection, but I do want to capture fleeting ideas and play with materials in a new way. 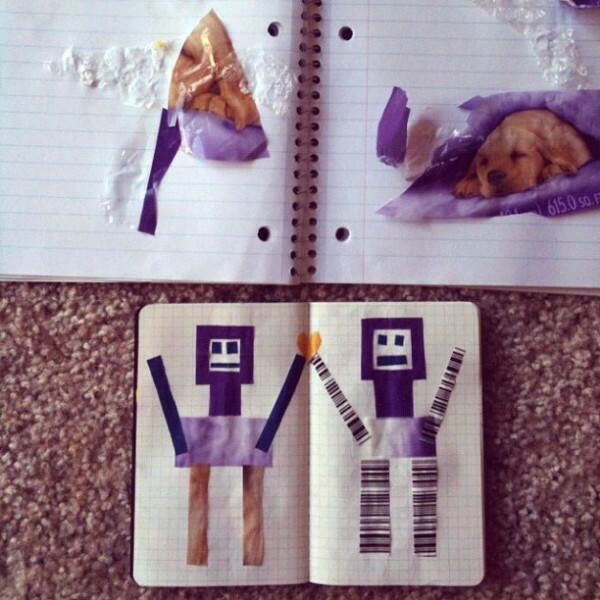 I love how Chelsey has taken on this challenge for herself and her daughter — in this example, they worked with similar materials (Cottonelle plastic bag) to create individually inspired pieces. The plan is to get the ideas out of your head and onto a page and create a visual record of experiences that you can refer back to at a later point. You may spend anywhere from three to twenty minutes (or more) on a DPS, and you shouldn’t worry about what the product will look like. This is about the process. 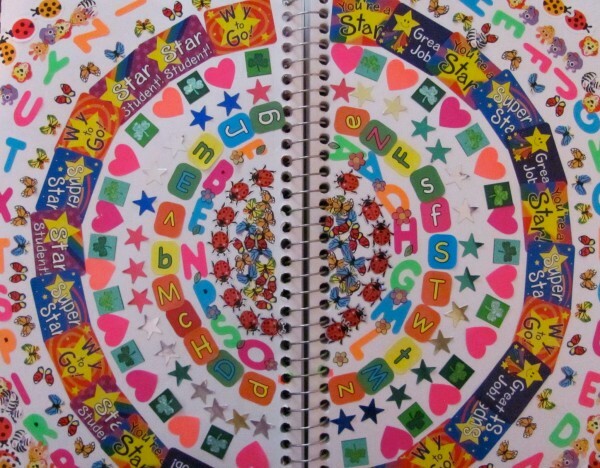 Melissa from The Chocolate Muffin Tree took a risk and used the huge collection of her daughter’s stickers to build this stunning mandala. No drawing necessary for those of you who don’t think you can draw! And what happens in this process? Some of your ideas may be crap, but crummy ideas can lead to other ideas that are fantastic. If you have a fear of making crap, you’ll make nothing at all and lose the possibility of getting to the good stuff. Simple as that. 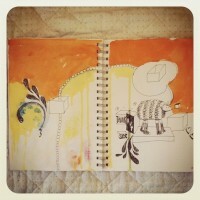 And finally, if you don’t have a sketchbook, that’s fine too. Many of us have cameras and smart phones that can document our ideas drawn on napkins, the backs of receipts, or even hands. 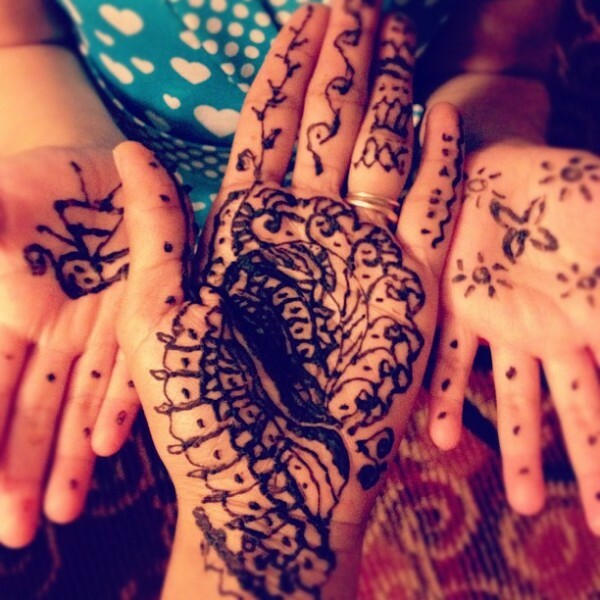 Maya, from Meme Tales, and her daughter created these delightful mendhi designs on their hands and then uploaded them to Instagram with the hashtag #tinkersketch. Write for five minutes. Circle all the words that stand out. Color them in.